This time of year it’s so chilly and grey, which often makes cooked veggies more appealing than raw ones, but we still do crave refreshing, crisp salads! 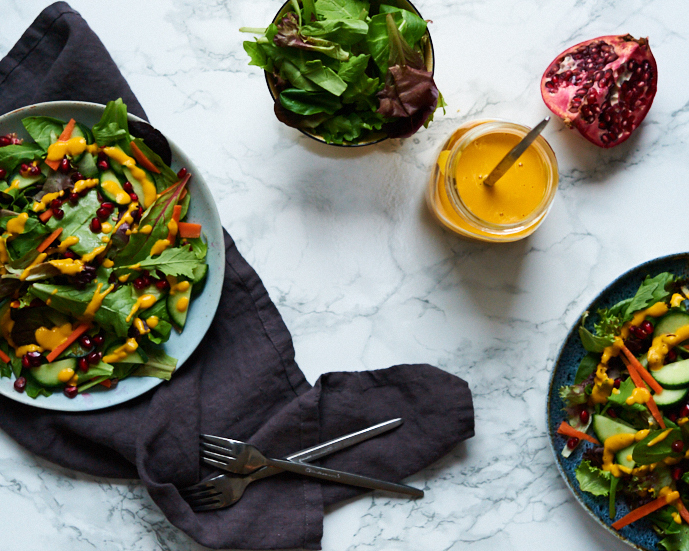 To find a balance, making the right type of salad dressing can make all the difference. We like to use ingredients that have some heat to them, like fresh ginger root. Blended in a salad dressing, the ginger root brings warmth and a slight kick that you can really feel in the back of your throat (perfect if you have a tickle, sore throat or cold). Plus, ginger warms up your digestive fire. This salad dressing is inspired by one that is found in the cookbook It’s All Good, with some of our own modifications. We absolutely love using miso that is made from chickpeas (chickpea miso), instead of soy based miso. This still provides you with all the gut loving bacteria of fermented foods but is safe for anyone who can’t eat soy. We absolutely love the bright orange colour of this dressing, that alone is so uplifting and makes us feel warm! We hope that you will love this Carrot Miso Ginger Dressing as much as we do. Blend all the ingredients in a high speed blender until it’s all creamy and smooth. This will keep for up to 4 days in the fridge.